Far left is a spawned rocket in waiting/landed state. Middle is rocket during flight. Right is game over screen after crashing rocket. What was our inspiration... Getting some donuts at 12am? Yeah, that sounds about right. Also, who doesn't like flying rockets? 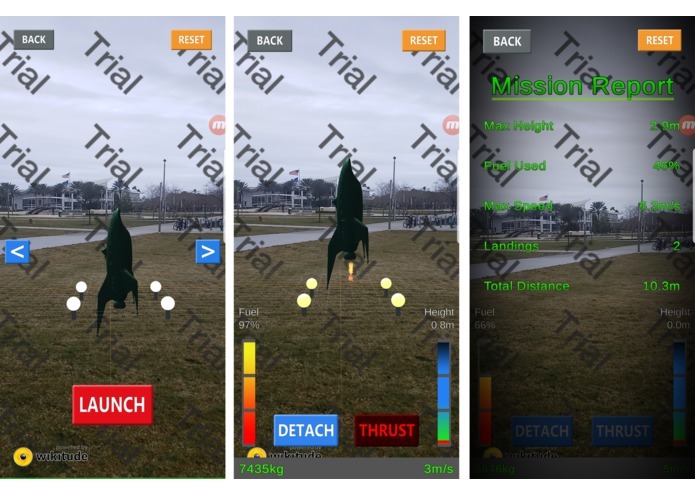 ARocket is a mobile app that launches rockets and other spacecrafts in augmented reality (AR). It shows the fuel/weight and speed/height of the aircraft and you can even land it, or come down too hard and crash - which we all did after the sugar-rush ended. All of the 2D user interface elements were home-grown. Everything was written in C# using Unity, with an AR API called Wikitude being the backbone of the functionality: the free trial has this humongous watermark that annoys everyone, but hey its free! We deferred from using the built-in physics so we can customize our own arcade-y physics. The image tracking in the AR API we used was a bit unreliable at times, so it took a lot of tweaking with the settings to get the aircraft to display in the AR world reliably. The "smart" tracking was not smart. We managed to follow SCRUM pretty well; our sprints were 3 hours each. By the end of the first two sprints, all of our UI elements were created and the basic prototype of the AR aircraft launching was complete. Admittedly, the later sprints just blended together into one lump of sugar-fueled coding. Also, it's not really an achievement, but our design decay is very evident (in a good way). We intended for this project to be a rocket simulator of sorts during the design phase, but it ended up being a mashup of all our own ideas into an arcade-style rocket game where the objective is to fly as high as possible, burn as much fuel as you can and land without crashing. Focus on backend first. There were a few things (like visible rocket stage-separation) that we did not implement simply because we spent too much time gold-plating our user interface. After testing the app for hours, our eyes learnt to hide the watermark. More rockets. Multiplayer AR sessions. More Michael Bay explosions. Integrated Wikitude's AR SDK into Unity. Glued the front-end to the back-end and did the coding behind the user-interface and some of the physics.